After our first week of settling in we have formed a little morning routine. We enjoy our morning tea on the poofy couch in the living room and read the daily news thanks to the neighbour’s wi-fi that we are secretly borrowing for free. Wi-fi – it truly is the second most important thing a traveller needs. While enjoying the quiet there is a sudden door slam. Slightly confused, we realise there is someone else in the house. It must be another volunteer that arrived in the early hours of the morning while we were still fast asleep. Enter Sally Macgarry – the most fun and fascinating Welsh person I’ve ever met. 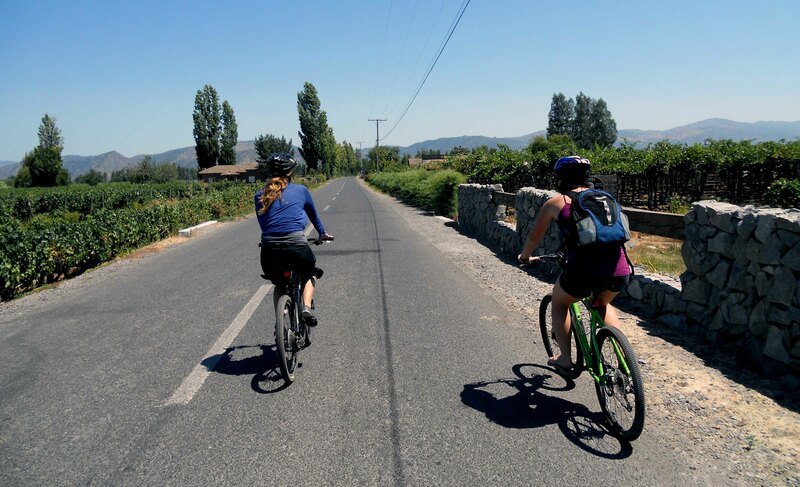 A self-proclaimed alcoholic (not the dangerous kind), enjoyer of all things festive and here to explore the wine region of Chile before starting a 3 year course on wine making back in the UK. Now I’ve heard of and met people with some strange, irrational fears. The fear of the number 13 for instance, Triskaidekaphobia, was an affliction of a boy I knew in pre-school. But Sally brought a new one to the table – a fear of bananas. Not just the “Eeeuw-I-don’t-eat-bananas” kind of fear, but full blown, hyperventilation inducing, tears flowing, screams escaping Bananaphobia (there really is such a thing). I don’t really take her very seriously when she tells us about this little quirk, so one morning I make a sandwich filled with delicious, sweet strawberry jam and perfectly ripe banana slices only to cause a violent anxiety attack with Sally almost jumping out a barred window when my plate moves too close to her. I have never felt this kind of bad about something before. Sorry Sally, didn’t mean to..but you should really look into a support group or something. Being in wine country one is compelled to visit at least one wine farm. We are lucky enough to visit a few and taste some exclusive wines. Montes with the most beautiful views of the hills. Viu Manent, one of the most visited in the area. Laura Hartwig, the vineyard we walk through daily. 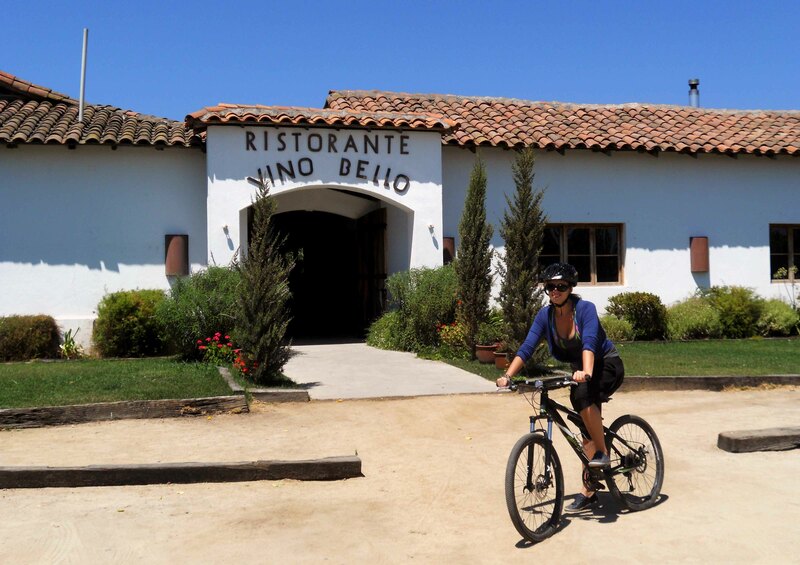 Somehow Sally manages to convince us to rent mountain bikes and cycle through the valley on our own customised wine tour made for 3 to Mont Gras and Estampa. This is a brilliant idea in theory, but a whole different thing in practice. 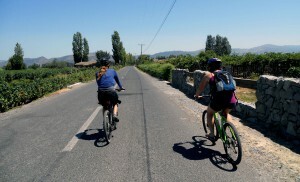 After a few hiccups with the bikes, cycling for what seems to be too far, getting a bit lost, asking for directions, a tumble (Sally) and an almost tumble (me) we finally make it to the beautiful Wine Estate of Mont Gras. Christian meets us with much needed bottles of water in hand. A native Chilean with near perfect English language abilities who has visited South Africa is hard to find. We were going to have a lot to talk about! We love talking about our country, and he has a bit to teach us about our homeland. Christian visited South Africa in 2010 during the Soccer World Cup as a volunteer worker and stayed with a Venda family for two months. What an experience that must have been for him! Christian takes us to the vineyards where we taste different types of grapes used in the production of different wines. Merlot, Cabernet Sauvignon, Pinotage, Syrah and of course the Chilean Carmanere grape. We learn how to distinguish different grapes by the shape of the leaves and eat so many that I feel like I had a meal. He then takes us to the warehouse where I taste Chardonnay directly from the tap of a massive steel barrel that almost reaches the ceiling of the warehouse. 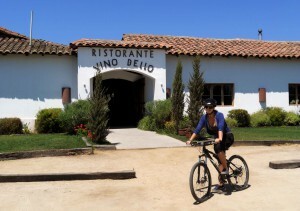 Sweet angel nectar dripping from my chin, I know this bike wine tour was an excellent idea. We move on to the courtyard where the 4 of us sit down and taste a selection of the finest Mont Gras has to offer, including their most expensive bottle, opened this morning for an exclusive guest that happened to fly in on his helicopter for a quick tasting. Our lucky day! Slightly intoxicated we discuss politics, history and the future of South Africa. We had an exceptionally great experience at Mont Gras, thank you Cristian. Our next stop is Estampa Winery. Luckily it’s not too far away as all three of us are a bit of a safety hazard on our bikes right now. We are welcomed by Felipe at the very modern and sophisticated establishment. They have veered off from traditional wine making methods and have a fresh and clean (sterile) feel to their surroundings. Their glass buildings house thousands, even millions of litres of wine underground and Estampa’s approach is probably the future of wine making. We taste one red and one white – not really tasting much anymore – and just decide to buy a bottle of each to taste some more later. All their wines are blends, a safe choice, and generally enjoyable for most wine drinkers. We cycle the scenic route back to the resto to have some dinner and leave the bikes behind. At home the three of us enjoy our purchase, laugh, share stories and Sally teaches us how to play Yatzeeee – all while we are thoroughly plastered. We enjoy a bit of routine in the little town of Santa Cruz. We become part of the community and experience their town festival and street market. We feast on fake “anticuchos”, which is just a huge delicious sosatie, and we know now where to buy the best fruit on the street. But we decide that this will be our last volunteer venture and the rest of our travels will be pure adventure, until our money runs out that is..
Three weeks after our arrival it is time for us to greet our hosts and new friends, and make our way back to Santiago where we are so happy to stay with our friend Gonzalo once again. We relax and revive for 2 days, stock up on supplies for the next part of our trip and plan where the wind will take us next. Further west towards the Pacific Ocean I say! This entry was posted in Chile, Travel and tagged Bye, Chile, Colchagua, Estampa, good, Laura Hartwig, Macgarry, Mont Gras, ocean, onwards, Pacific, Sally, Santa Cruz, Viu Manent, wine. million years have thought that someone could be afraid of bananas!